The metal on metal hip premature failure debacle expanded in 2016, with the stealth recall of the LFIT V40 femoral heads manufactured by Stryker Orthopedics. Metal on metal hip implants have a high failure rate including those manufactured by Biomet, DePuy, Encore, Smith & Nephew, Stryker, Wright and Zimmer. Stryker Orthopedics issued an "Urgent Field Safety Notice Alert"in late 2016 warning about a new hip implant recall concerning select LFit V40 femoral heads due to higher than expected taper lock failures. These recalled Stryker hip implant femoral heads are used on both Accolade TMZF and Accolade 2 stems as well as Meridian and Citation stems. 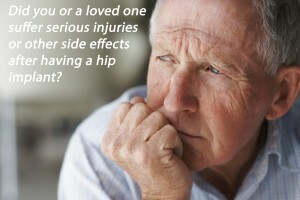 Dangerous side effects from these failures include: Disassociation of femoral head from hip stem, Fractured hip stem trunnion, Excessive metallic debris and numerous other complications, all requiring extensive and painful hip revision surgery. If you or a loved one had a Stryker Metal on Metal Hip Implant and have suffered injuries or wrongful death with the device, contact the attorneys at Dr Shezad Malik Law Firm to learn more about your legal rights. You can speak with our team by calling toll-free at 888-210-9693 ext. 2 or 214-390-3189, or by filling out the case evaluation form on the right of this page. Our law firm’s principal office is in Dallas-Fort Worth, Texas. Dr Shezad Malik Law Firm represents clients in dangerous drug and dangerous medical device lawsuits nationwide. Australian health officials warned about the side effects with some Stryker LFIT V40 femoral heads which have been associated with high failure rate, and raising concerns about the safety of the hip implant device worldwide. Stryker LFIT Anatomic CoCr V40 femoral heads manufactured before 2011 are subject to catastrophic failure and metallosis problems, which could cause patients to experience loss of mobility, pain, inflammation, local tissue reactions, dislocation, joint instability, broken bones around the components. Stryker sent a warning notice to orthopedic surgeons who have use the hip implant in 2016. According to the warning, the Stryker LFIT hip implant components could cause taper lock failures due to inconsistency with the taper lock interface. Stryker has not disclosed the cause of the failures, either it is a manufacturing defect or this is related to a design defect that was present in 2011 or earlier. Orthopedic doctors have reported hip failures similar to the Rejuvenate and ABGII recall that occurred in June 2012 and also reported similar failures with the V40 Cobalt/Chrome head when matched with the early version of the Accolade stem that was made of the TMZF metal alloy (TITANIUM, MOLYBDENUM, ZIRCONIUM and IRON). Stryker hip implant failures, maybe as a result of the TMZF alloy in the recalled Rejuvenate and ABGII, that could be the common denominator on the Accolade stem too. In 2014, many lawsuits were filed in U.S. courts indicating that patients had suffered Stryker LFIT V40 femoral head failures, alleging that the components were defectively designed and manufactured. If you think you may have a Stryker LFIT V40 Head or a Stryker Accolade TMZF stem and are experiencing pain potentially caused by metal corrosion, metallosis or have suffered a spontaneous dissociation requiring full revision and emergency care, please call us.